En Prison - French term for the favorable option offered at some single-zero roulette tables. The player doesn't lose his even-money bets if the zero shows. Instead the bet is locked up (imprisoned) for another spin. If the bet wins, it is returned fully. If the bet loses, the house collects it. When you first walk up to the Roulette table you might not know what game it is. 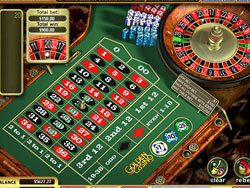 American and European Roulette look almost the same except for one minor difference. American Roulette has an extra space on the wheel and the table. That extra space is the 00 spot, which means the American Roulette wheel has 38 spots on it.